For the crust, combine flour, sugar, and salt in a bowl. Add milk and oil all at once. Stir with a fork. Shape into a 5-inch disc and pat into the pan or place between 2 sheets of floured wax paper and roll into a 12-inch circle. Transfer to pan. Trim edges and use trimmings to patch where needed. Set aside. With an electric mixer on medium, combine all ingredients except pecans (takes about a minute). On lowest speed, stir in pecans. Pour into prepared pan, place pie ring on the rim and bake for about 35 minutes or until the center jiggles just a little. Cool completely before serving. Notes: To make chocolate-pecan pie, simply add two tablespoons unsweetened cocoa powder to the filling. Chocolate chips can also be added. For info on pie rings, click here. 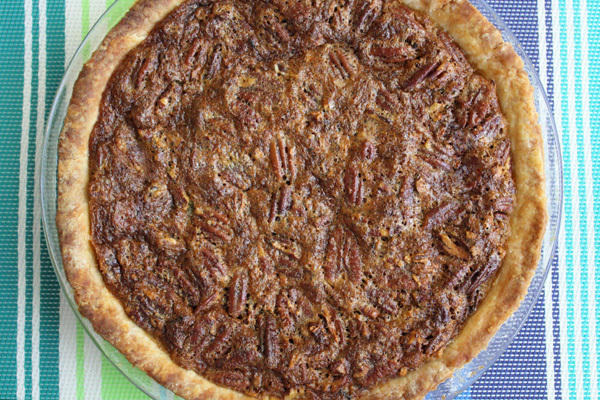 For my pecan pie without butter, click here. 8 Comments on "Easy Pecan Pie"
We used to get chess pie in grade school, back in the days when we had real cooks. Think your recipe would be like your pie without the nuts? My husband is allergic to nuts but not peanut oil (strange) or olive oil. Can maple syrup be used instead of corn syrup? Jenny, can I use maple syrup instead of corn syrup? Hello Jenny,Just made another one of your recipes-pecan pie! My husband said it was the best pecan pie I have ever made and believe me I have made many in my day as it is my favourite pie.Thanks for the great recipes. If you could share the recipe I might be able to help figure it out. Please post it here as a reply and I will do my best. hi,can you use more pecans then a cup maybe a cup and half. 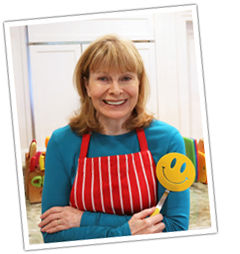 In fact, I used to make it with 1 1/2 cups of pecans but I was trying to keep it simple, so yes, feel free to go nut-crazy! !